The tunic has embroidered shoulder titles of the North Nova Scotia Highlanders with pips for the rank Lieutenant. Nice canvas/printed 1st Corps patch (Royal Canadian Engineers). Nice on canvas printed patch of the 2nd Corps (Royal Canadian Engineers). RCCS, 2nd Canadian Infantry Division canvas/printed patch. 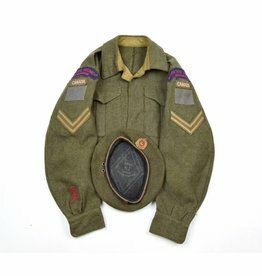 Insignia are wartime applied, the tunic has embroidered insignia and medal ribbons. Has two modification which were periodically done, extra closers on top and lower part of the tunic. The insignia are alle embroidered. 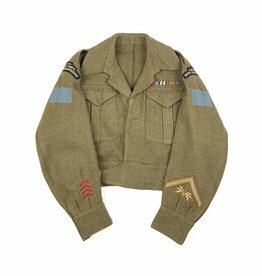 British Battle-Dress tunic from the 6th Battalion, King's Own Scottish Border Regt. The tunic has a tag with name of the soldier. The insignia are embroidered shoulder titles with printed division patches. The overseas chevrons are gone, the stitching is still there. The tunic bears printed shoulder titles and division patches with embroidered Overseas-stripes, Good Conduct chevron and driver patch. 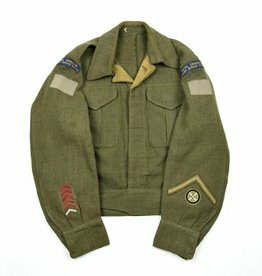 The tunic bears printed/canvas division patches with embroidered Sergeant chevrons, overseas stripes and RCE shoulder titles. Medal bar present. The tunic bears printed/canvas shoulder titles and division patches. Embroidered Lance-Corporal chevrons and three years overseas stripes.